Is that a sneer I see she's wearing on her face in this photo? She must be thinking, the Australians are nothing but copycats! 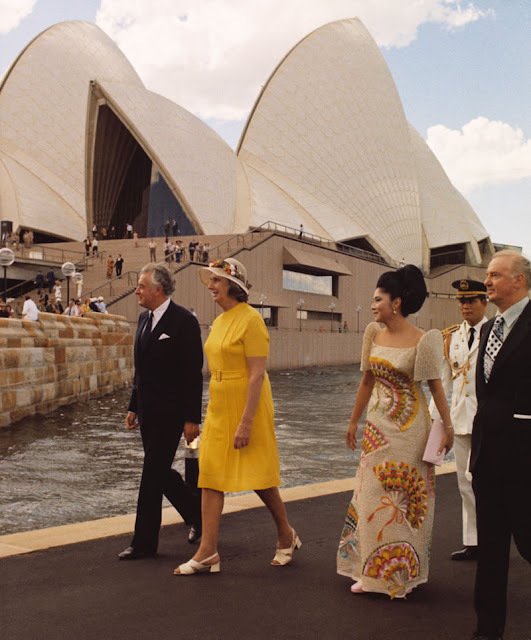 She inaugurated the Cultural Center of the Philippines, an iconic architectural masterpiece beside the sea at Manila Bay on 08 September 1969 while the Sydney Opera House was inaugurated almost four years later on 28 June 1973. Both edifices are dedicated to the propagation of the arts; of the true, the good, and the beautiful. Both sit astride an abutment into the harbor. They are nothing, but third-rate trying-hard copy cats!